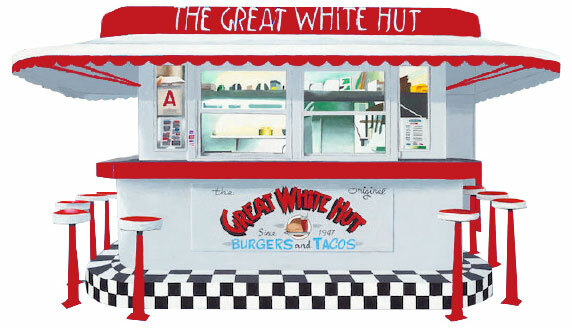 Since 1947, The Great White Hut has been located on the corner of Orange and California. As businesses have come and gone and buildings risen and fallen the little hut at the corner has stood its ground. Although the owners have changed over its nearly seventy year life the one thing that has tied all of them together has been the desire to make great food. We use fresh ingredients, make our own sauces, and marinate our own meat. At the heart of it we aren’t trying to solve the worlds problems, we just want to make great food that people can enjoy. Five friends who grew up in Glendale wanted to take a chance and become business owners when they saw the opportunity to highlight one of the cities smallest yet oldest businesses into a foodie destination. They wanted to show that through team work and forward movement even the smallest of places could make the greatest of food. We strive to keep quality as the most important part of our business. Our inventory is full of fresh ingredients that help make our tasty sauces a must have with every meal.